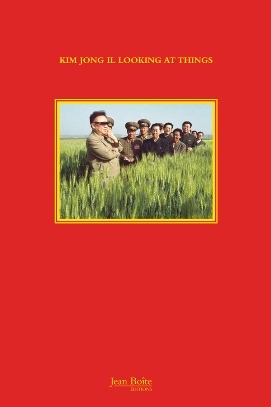 I picked up a copy of the hardback book of Kim Jong Il Looking at Things, the spin off from João Rocha’s amazingly popular tumblr site of pictures of – well of Kim Jong Il looking at things. Everything from tanks to bras, soft drinks to radishes, tupperware to vodka. Rocha, art director at Young & Rubicam’s ad agency in Lisbon, Portugal started posting pictures of the tubby tyrant looking at things, the sheer absurdity of the images caught on and North Korea’s Central News Agency kept pumping them out, more and more pictures for the world to laugh at. It’s amusing that while the Chinese are busy stamping out references to Tiananmen Square and assorted other things that upset them we’re also busy laughing at them. Check this Guardian article about how they have to be on top of photos of little Lego men facing a line of Lego tanks. Or the Tiananmen Square hero facing a line up of yellow rubber ducks, a reference to the recent giant rubber duck visit to Hong Kong harbour. And yet the Chinese authorities are not intent on protecting North Korean dignity. The latest member of the Kim dynasty – King Jong-un – is routinely referred to as Fatty 3, Kim Fatty III or Fatty the Third on Chinese social media. I photographed assorted North Korean billboards of Kim Jong Il or his father Kim Il Sung looking at things when I visited the country. And noted the absurdity of the dictators looking at harvest scenes while people were starving to death in a blog on the book Three Famines. 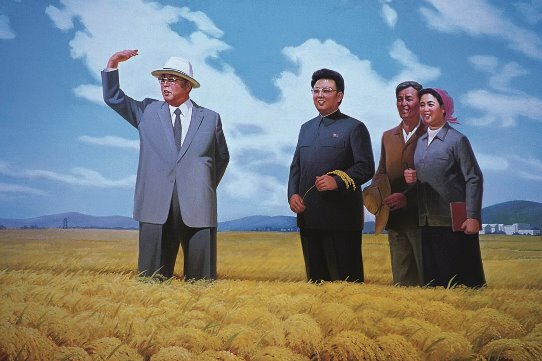 ▲ Kim Il Sung and Kim Jong Il looking at a harvest scene. In the next few days I’ll be posting blogs on interesting things I recently looked at in New York, Naples and Paris.